This easy Raspberry Peach Crisp is one of our favorite dessert recipes! 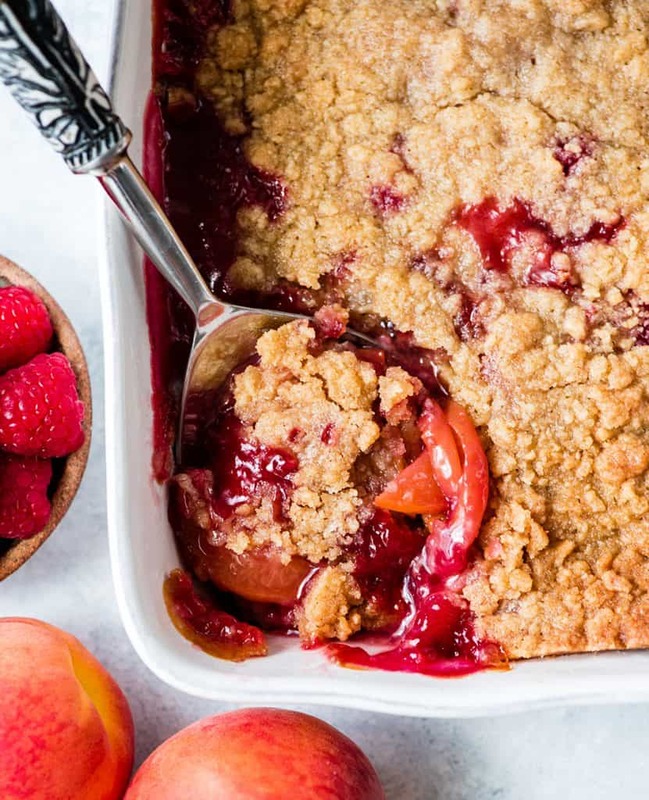 The buttery crumb topping paired with the sweet peaches and tart raspberries is absolute summer perfection! It’s easily made gluten-free, dairy-free and vegan! What are your favorite summer fruits? I adore them all, but I’d have to admit that my top two are absolutely raspberries and peaches. 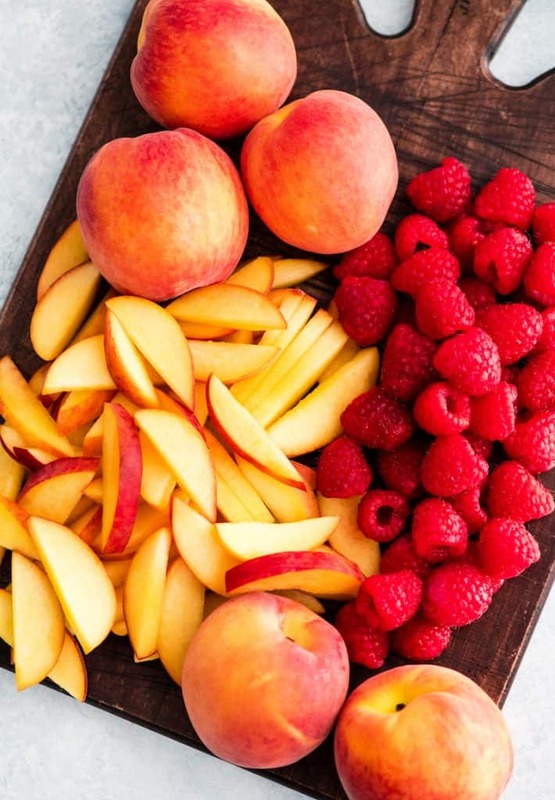 I don’t know why, but I just can’t get enough of both raspberries and peaches in the summer. That’s why I decided to create this Raspberry Peach Crisp recipe! I love a good fruit crisp, it’s like pie but takes half the work and time to make. Plus I am a total sucker for a buttery crump topping, and I often opt to use it instead of pie crust in my pie recipes! This easy raspberry peach crisp is SO GOOD and really versatile. 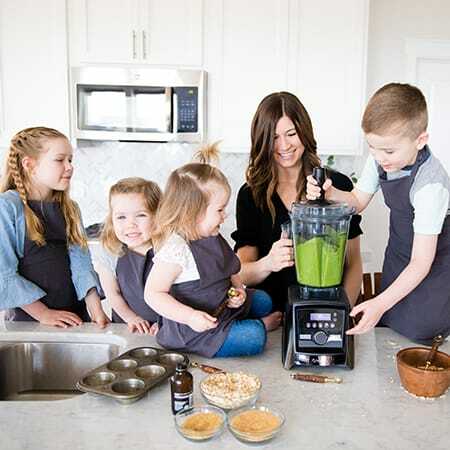 It can easily be made gluten-free, dairy-free and vegan! 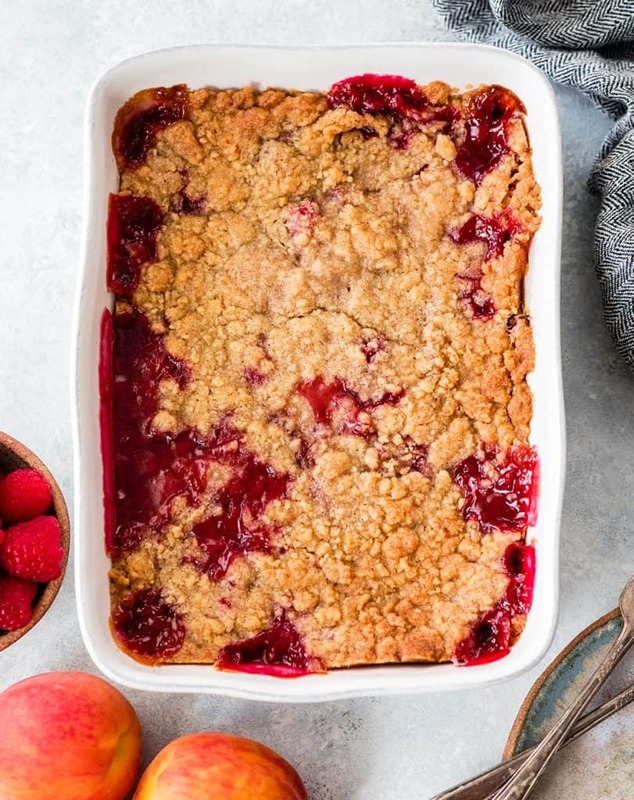 Here are a few tips to ensure that your raspberry peach crisp turns out perfectly every time! I recommend starting by making the raspberry peach filling so that the tapioca has some time to soak in some of the liquid! It’s really simple, just toss everything in a bowl, stir and transfer to the baking dish of your choice! Making the crumble topping is relatively easy! 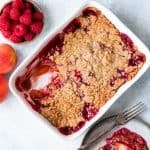 I made this raspberry peach crisp without oats, but if you’re interested in an oat topping check out this berry crisp! Here are a few tips to ensure your success! Use softened butter. I find it’s much easier to make a crisp topping when softened butter is used (as opposed to cold/chilled butter). This makes working it into the dry ingredients much easier. Cut in the butter. I use my hands to do this, and if you choose to do the same just be sure to try to handle the ingredients as little as possible! Another option is to use a pastry cutter, which is much less messier! Make sure you leave large clumps. do not over-mix the crump topping. The buttery chunks are what make it sooo delicious! Sprinkle on top evenly. As you can see in the video, it’s important to sprinkle the crumb topping evenly over the raspberry peach filling so that it bakes evenly! Once the filling and crisp topping are made, it’s time to put everything together, bake and enjoy! Here are a few notes! Baking dish shape & size. I used this 10″ x 7″ baking dish from Crate and Barrel. It’s one of my favorites! You can use a deep 10″ round pie plate or a 9×9″ baking dish as well! Baking time. This recipe takes about 35 to 45 minutes to bake, depending on your oven! 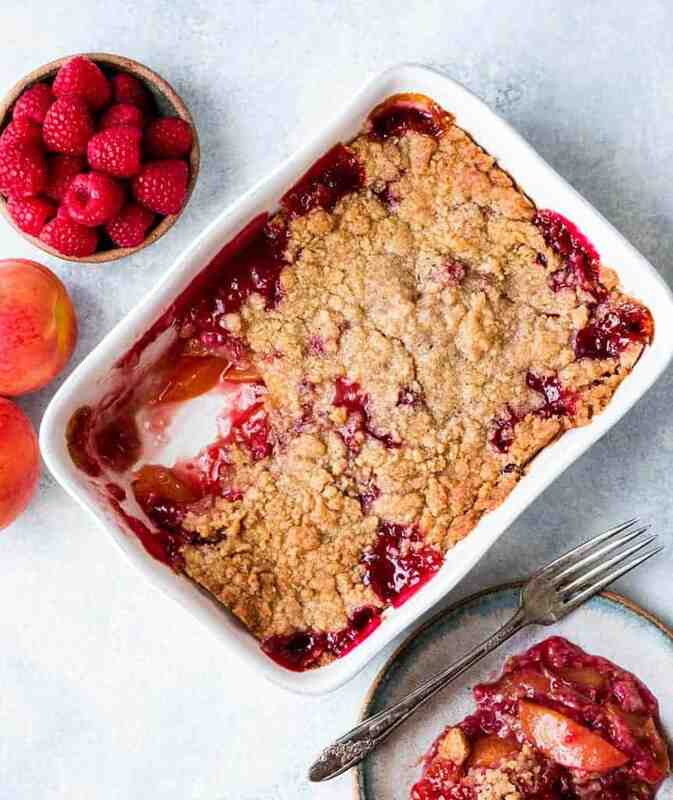 I recommend start by baking this raspberry peach crisp recipe on the lower rack of your oven to prevent the top from browning before the berries are cooked. If you don’t notice the top browning at all after 25 minutes, move it to a higher positing in the oven. The sign of doneness. The filling will bubble (see video) and the top will be a golden brown when this raspberry peach crisp is finished baking! At that time, remove it from the oven! To serve: let the raspberry peach crisp cool for 15-20 minutes and serve warm with vanilla ice cream, whipped cream, cool whip, etc. To store. store covered in plastic wrap or in an airtight container in the refrigerator. Please be aware that the crisp topping will get a little soggy if stored in the fridge. 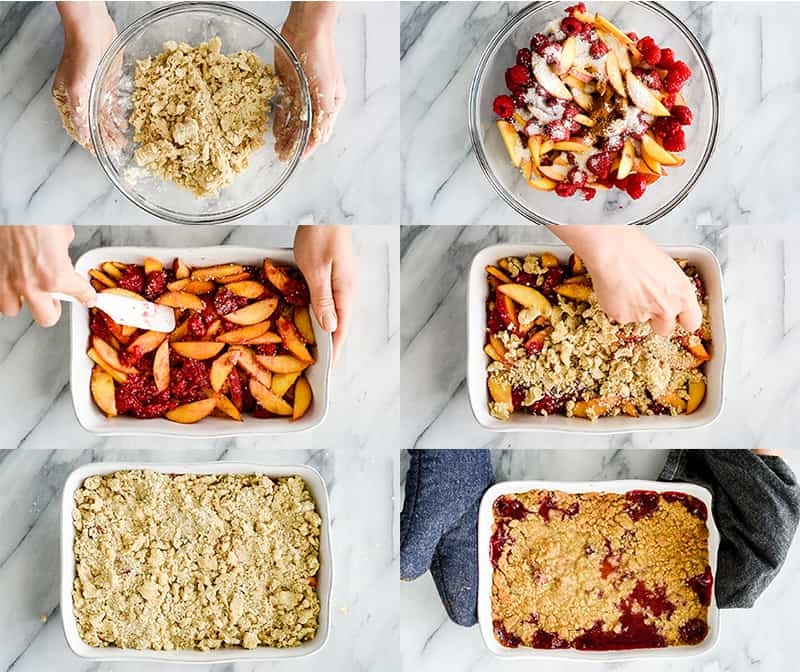 To reheat/re-crisp: To reheat the raspberry peach crisp and restore the crispy top, warm it in the oven at 350 until the topping is crisped again! Granulated sugar. I use organic cane sugar in this recipe. Any granulated sugar of your choice will work well! Brown sugar. For a refined sugar-free option, coconut sugar works in the place of brown sugar. Instant tapioca. This is an absolute fruity dessert baking staple for me. I am never without it in my kitchen. It thickens pies without detracting from the flavor. I recommend buying some, it’s worth it! Otherwise tapioca flour and cornstarch also work well as thickeners. All-purpose flour. 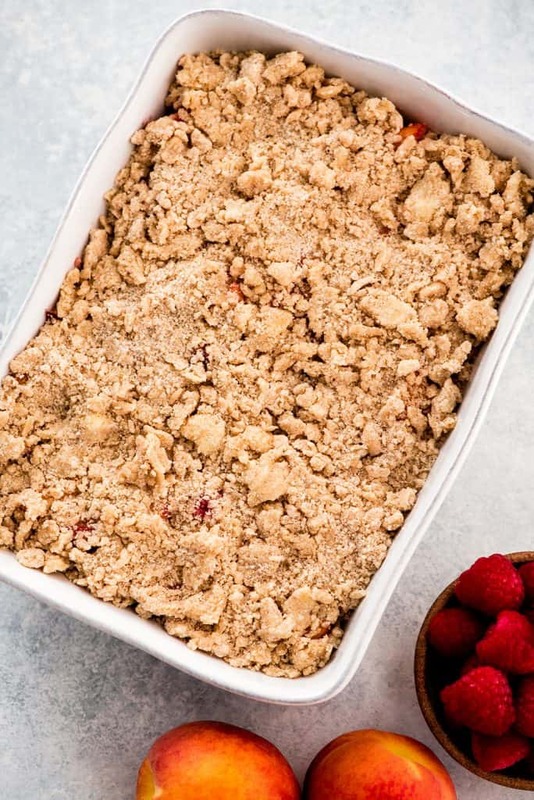 Feel free to substitute your favorite 1:1 all-purpose gluten-free baking flour to make this Raspberry Peach Crisp recipe gluten-free! This easy Raspberry Peach Crisp is one of our favorite dessert recipes! 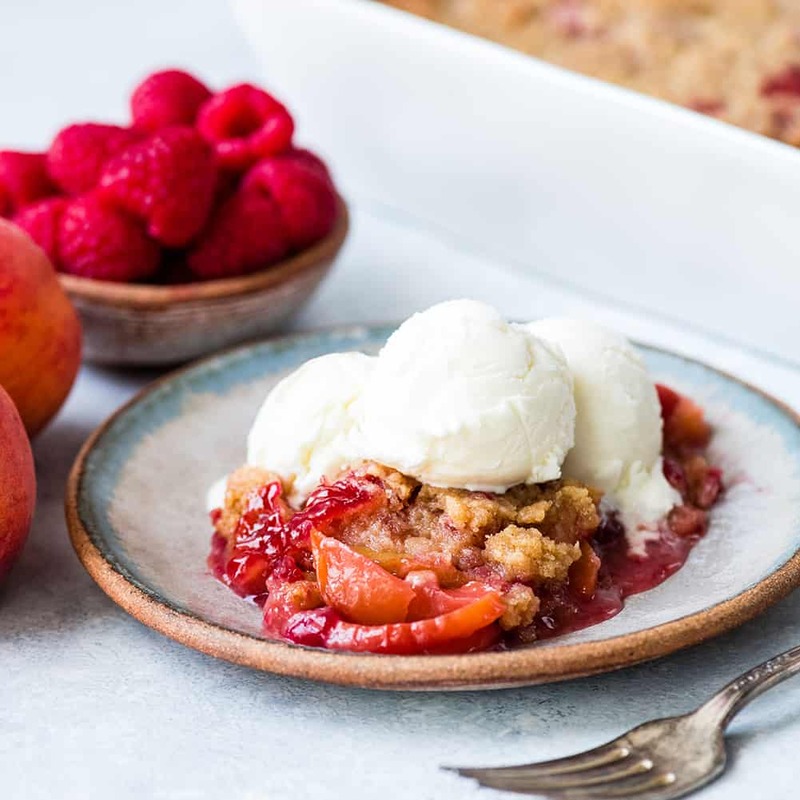 The buttery crumb topping paired with the sweet peaches and tart raspberries is absolute summer perfection! It's easily made gluten-free! Grease a 9x9” baking dish or 10” round, deep pie plate. Set aside. In a small bowl, combine granulated sugar, instant tapioca, sea salt and cinnamon, stir and set aside. Put chopped peached in a large mixing bowl. Add dry ingredients to the peaches and gently stir until evenly distributed. Add raspberries and very gently stir until evenly distributed. Set bowl aside. Place crisp ingredients in a small bowl. Use hands or pastry cutter to combine, cutting the butter into the dry ingredients. Combine until mixture is crumbly with some buttery chunks. Pour raspberry peach filling into prepared baking dish. Spread so the top is even and as flat as it can be. Use your hands to sprinkle the crisp topping over the filling. Bake on the lower rack in the preheated oven for 35-45 minutes, or until filling is bubbly and the crisp topping is golden brown. Remove from oven and let cool for 15-20 minutes. Then serve warm with vanilla ice cream or whipped cream!